These days it seems like everyone is talking about the Return On Investment (ROI) of college. Students are asking, “If I go to college, what will the benefit be?” When I was applying to school, things were simpler. I got in a few schools and made a decision based on programs, location, and school size. Now, as college costs are sky-rocketing, students are thinking longterm rather than short-term about their college choice. Students are wondering whether the amount debt they are accumulating by going to college will be paid off by the degree they earn as an outcome. In some cases, the answer is that it won’t. Some students will go to a 4-year school only to end up with a job that pays as much as one they could have got without a degree. The decision comes down to choosing a school where the cost of your degree will be outweighed by your post-grad earning potential. Rather than looking at a list of the least expensive colleges, students would be better served to look at the schools with the best ROI. 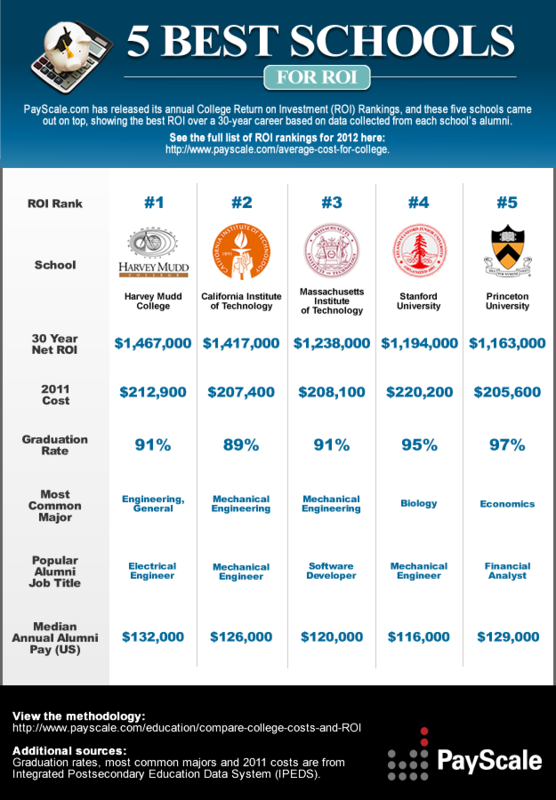 Below is PayScale’s “5 Best Schools for ROI” infographic, which will give you a look at some good schools to consider. However, not all students can attend these 5 schools (300 person lectures are crowded enough as is), so I would also suggest taking a look at their “2012 ROI Rankings” to see where the schools on your college list fall! Good luck and yay, college!